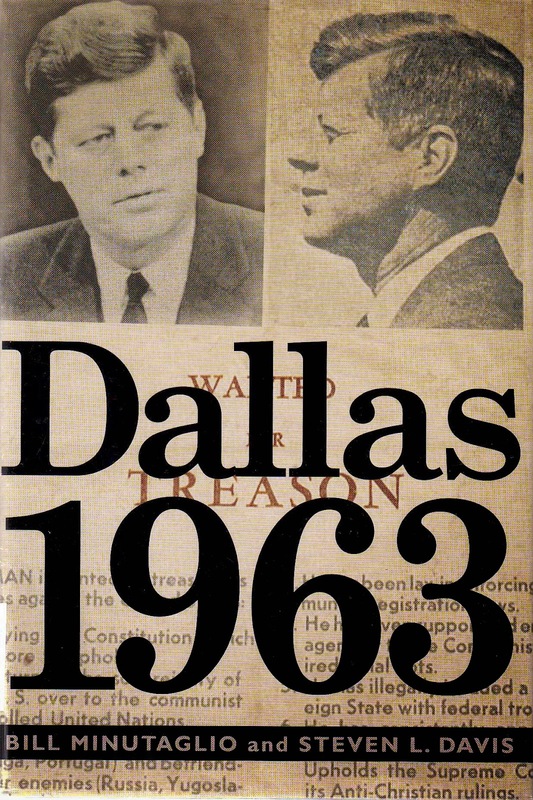 Here’s an interesting little book which got lost among the plethora of stuff released last year for the 50th anniversary of the assassination of JFK. This book, however, is a bit different than the rest. There is no exploration of any theories surrounding the Presidents murder. Instead, it is a portrait of a city conflicted by old money and new morals. The book examines the 3 years between January 1960, when Kennedy was running for President, and November 22, 1963 when he was killed. Month by month the authors take you through what was happening in Dallas during that time in relation to Civil Rights, and the public’s reaction to both the Bay of Pigs and the Cuban Missile Crisis. These events helped to fuel the already predominant view amongst conservative fringe groups that Kennedy; and his entire administration; were closet Communists. The main characters in this dramatic run-up to the Presidents assassination are a veritable who’s who of the Dallas social/political world. There is oil tycoon H.L. Hunt; who funds right wing causes, as well as newspapers and media ads calling for the U.S. to get out of the United Nations, and the Impeachment of Earl Warren as Justice of the Supreme Court. The echoes of these actions in Texas were felt all across the country. The John Birch Society was helped enormously by Hunt’s campaign of radical rhetoric. Disgraced Army General Edwin Walker; whom Oswald would attempt to assassinate 6 months before he killed the President; is shown in all his glory here. Beginning with his resignation from the Army, to his delusional Presidential aspirations, the General is exactly the character portrayed by Burt Lancaster in the film version of the book “Seven Days In May”; which is almost a play by play account of what General Walker was up to. That book was one of Kennedy’s favorites, as it dealt with the showdown between the military and the President over nuclear disarmament; which is exactly what he was attempting to do. And he was meeting with the same resistance; both in and out of the White House; as his fictional counterpart was in the book. His meltdown in front of a Senate Committee was fascinating. Reverend W.A. Criswell, head of the Dallas First Baptist Church, led the country’s largest Baptist church at the time and was squarely aligned with the segregationists in opposition to Civil Rights for Negroes. His goal was to baptize H.L. Hunt as a way to avail himself of Hunt’s money. He was successful in both endeavors. Congressman Bruce Alger, an oily politico from Dallas, has a gaggle of women who are smitten with the vitriolic speeches he makes about President Kennedy and the menace of Civil Rights. He is known to have bedded many of them, in spite of his own marriage. Stanley Marcus, owner of Dallas based Neiman-Marcus, spent the years between 1960 and 1963 walking a tightrope. He doesn’t want to lose business, but he doesn’t want to knuckle under to the right wing fringe groups. He brokers a deal where-by his store will allow Negroes to sit in his restaurant alongside of white patrons. He then convinces other businessmen to do the same. Dallas is quietly integrated. Ted Dealey is the editor and owner of the Dallas Morning News; a fiery right wing daily. Dealey Plaza was named for his father who founded the paper. In the 1920’s the KKK moved its national headquarters from Dallas after the elder Dealey convinced the city’s fathers that it was not good for their image as an up and coming city. But the younger Ted Dealey is in league with some of the more racist and conservative elements in Dallas. He takes the advertising money for the hateful ads; all the way up until the night before Kennedy’s fateful visit. The quotes from General Walker about racial purity, and his obsession with Communist infiltration of the government, will have you thinking of some of the rhetoric you hear about the current administration. Medicaid was also in the news at the time. It was touted by the right wing radicals as being a blank check for the President to have a “Death Panel” and kill off elderly Americans. There are so many players here that I can’t include them all in this short review. Let’s just say that this book, more than any other, captures the mood and feel of Dallas in the 3 years leading up to the Presidents murder. It draws no conclusions; it plays no angles; it has no agenda. It is; instead; an account of the small part which so many people and groups played in creating a climate of hate and danger. Adlai Stevenson's legendary visit to Dallas; just weeks before the President's murder; is a prime example of that climate at the time. It is said that we are all characters on a stage; and if that is true then we all contribute to the larger picture, which is a product of our individual actions. We; as a society; are the sum and total of our collective selves. The good elements outweigh the bad ones when we are lucky. But when the darker forces take root and hold sway, we all suffer the consequences. The book seemed familiar to me in style and in the way it builds towards a climactic ending. I read a lot of books, and the authors names sometimes get lost in the jumble, but their individual styles are often instantly recognizable. Such was the case with this book; which, in spite of its being co-authored by Mr. Davis; bears the unmistakable mark of Mr. Minutaglio’s unique style. Together they comprise an even more formidable team.